Nationwide Building Society estimates that people in the UK could receive an additional £594 million on their savings and investments by topping up their existing Individual Savings Accounts (ISAs) at the beginning of the new tax year, rather than at the end. Andrew Hagger, head of news and press at Moneyfacts.co.uk, the money search engine comments “Over the last couple of years we’ve seen the emergence of more current accounts offering high credit interest rates, some of which are on a par with the top paying savings accounts. “Traditionally, people keep their current account for managing their day to day finances and maintain a separate savings account, often with a different institution, in which to hold their savings balances. Women in UK incur huge debt through unsecured personal loans which they spend on shopping and fashion. As per the recent research on spending habits of women in UK by price comparison site Uswitch.com , the female population of the country owes unsecured loans of more than £20 billion and overdraft debt of £4.6 billion with the average summing up to £515. Fixed-income investing is absolutely essential to protecting and growing your nest-egg - if you know what you are doing. As retirement approaches, your investment horizon shrinks. In other words, the closer you are to retirement, the less chance you want to take that you could lose a sizable portion of your investments. You want to more aggressively protect your assets from the stock market's volatility. Many advisors suggest that people at this point begin increasing the bond portion of their portfolio to 50% or more to lower their overall investment risk. 10% Tax Band abolished - Will mean low earners pay more tax. NI upper limit raised £37,440 (April 08) - A large tax rise for middle class. 40% Tax band threshold raised from £38,000 to £43,000 (April 09). Further £1 billion to be spent on working tax credits. Pensioners - Guarantee to rise to £130 per week by 2010. Child Benefit to rise from £17.45 to £20 by 2010. Childcare cash back will rise from 70% to 80%. “As the end of another tax year approaches, banks and building societies have been stepping up their efforts in an attempt to capture their slice of the huge ISA market. “When the Mini Cash ISA was first introduced in 1999 as an easy tax efficient way to save, the majority of ISAs were straightforward, either instant access or notice and occasionally with an introductory bonus. With less than a month left for UK consumers to make the most of their current tax-free ISA savings allowance, Barclays from Friday 16th March introduces a new cash ISA paying 6.50 per cent AER interest. 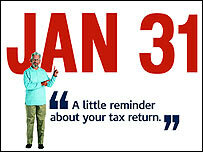 Customers are able to save from as little as £1 and up to £3,000 in each tax year. Andrew Jones, Barclays Product Director, said: “This is the best no catches cash ISA rate to hit the high street this year. Interest rates have been going up in recent months but until recently the best AER you could get on a cash ISA was below 6 per cent.